Warning: it’s gritty. I did not take the advice from the Epicuious recipe I based this variation off of and expel the custard mixture of basil leaves with a “fine mesh strainer” before churning it into ice cream. That would have been more, well, refined. But then, aren’t home-cooked specialties supposed to be a little gritty? I should call this one Brooklyn Basil Lemon ice cream. That said, it still tastes phenomenally good: 100% pure basil refreshment, with just a little tang of lemon. I don’t understand why folks aren’t putting basil in their ice cream every day now. Throw in tomatoes too, why not? Make a Caprese-themed ice cream with some nutty buffalo mozzarella slushed along with cold cream. What about basil mint ice cream, or basil chip? Basil frozen yogurt. Basil. Basil. Basil. If I’m basil-ing you out right now it’s only because I’ve been admiring my windowsill basil plant for the last two weeks. It’s fragrant, and its silky leaves capture sunlight with the translucency of a butterfly’s wing in the mornings, when the sun pours in from the windowsill where it sits. Which happens to be where I like to sit on mornings, especially weekends, with a magazine and coffee. Since the leaves aren’t exactly tough, I didn’t see the need to strain the ground-up basil bits from this ice cream batch. Therefore, this ice cream has a slightly grainy mouthfeel that I sense is not ideal. It’s aggravated tenfold by the use of lemon zest, tiny granules that I tossed in without thinking too much about the consequences. These do not soften up with any more ease than the basil leaves. If anything, I would just leave out the lemon zest next time and skip the straining step again. But still. this flavor is wonderful — herbal and fruity at the same time. A tea-like infusion of basil with sweetened milk and a squirt of lemon. Because I didn’t want the lemon juice to curdle anything, and because it always tastes better when it’s added at the last minute to anything, I squeezed half a lemon into the ice cream while it was halfway into its churning cycle. Fresh flavor like this is hard to come by in purchased ice creams, without paying a hefty price at a fancy restaurant perhaps. It might not be as rich as Haagen-Dazs too, but I made it that way intentionally (bikini season’s coming up). I was motivated to make this ice cream mostly for my friend Karol, as a long overdue response to a request she made when I first got an ice cream maker. 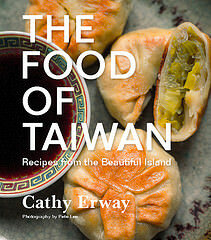 Now, I really just want to eat it alone, perched at my windowsill, those mornings with coffee and reading. When I look outside, I have a view of the street. It’s a tall view, from the fifth floor, and I can see the tops of three-storied brick buildings lined up in neat ridges for three streets ahead. I’ll watch the posse across the street chatting on their stoop when it’s nice out, hear the occasional car with the loud stereo pass by, or the little girl downstairs always scraping around on a skateboard. With a taste of the wayward plant being nurtured from this window fresh on my tongue, I’ll soak in some of the day. It’s gritty here. It totally works. 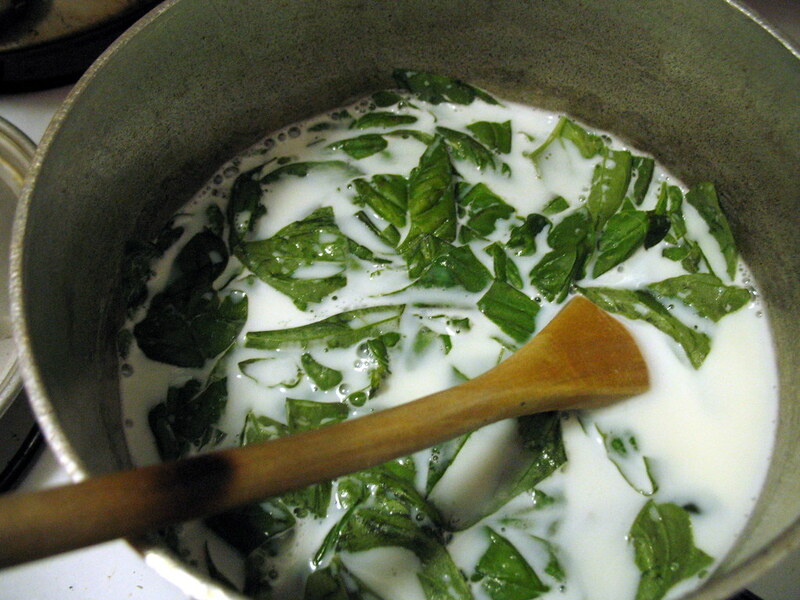 Bring milk, cream, basil, zest, salt and 1/3 cup of the sugar almost to a boil in a medium-large saucepan, but do not boil (this is commonly referred to as “scalding”), stirring. Remove from heat, cover pot and let steep for 30 minutes. Transfer in batches to a blender and puree until the basil is finely ground, about 2 minutes. 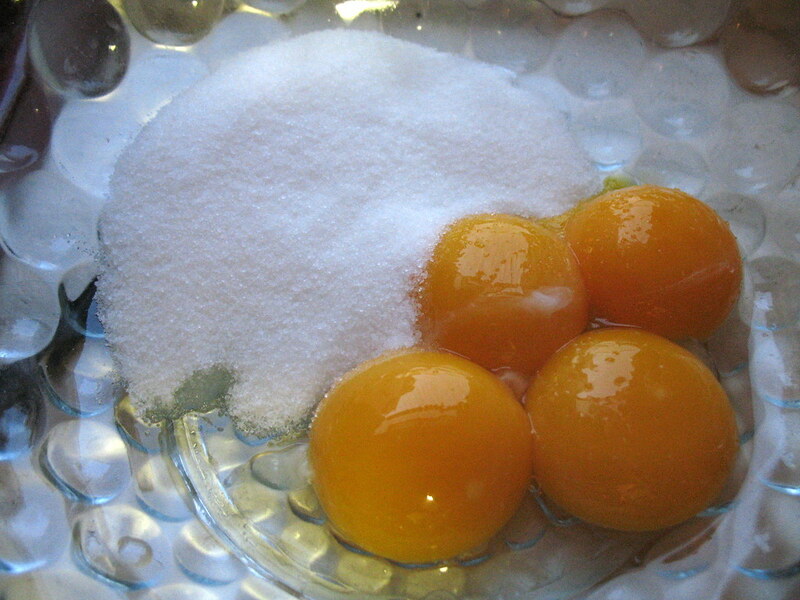 In the meantime, beat the egg yolks with the rest of the sugar in a large bowl until pale and fluffy, about 1 minute. Gradually pour in the warm milk mixture, adding just a tiny bit at first and stirring constantly. When it’s thoroughly blended, transfer mixture back to the pot. Cook on medium, stirring constantly with a wooden spoon, for about 4-6 minutes or until mixture is thick enough to coat the back of a metal spoon. Do not let it boil. Remove from heat. Transfer to a cool, covered pot and let cool completely in a refrigerator at least 2 hours. Or, to hasten the cooling process, place the new container inside a large bucket or pot of ice water. Once mixture is relatively cold, pour into an ice cream maker and follow the machine’s instructions for duration. Roughly halfway through the churning process, pour in the lemon juice. Transfer to an air-tight container and freezer 1-2 hours before serving to “ripen” the ice cream. Eight brownie points: Ice cream is ice cream. Which means, it’s not healthy. Even though this one has fresh basil, which actually packs a good deal of vitamins commonly found in leafy greens, and even though it has plenty of calcium and a microscopic bit of lemon juice Vitamin C, it’d be downright irresponsible to say, go ahead and gorge on this to get your nutrients. I’m not saying I wouldn’t do it myself, though. 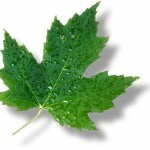 Three maple leaves: Not looking too good. Alright, so here’s the scoop: milk and egg prices, like all groceries, are rising right now. But the intensity of the rise doesn’t look like it’s quite caught on to organic products; placed side by side at the store, they’re now closer in price than I can ever remember them being. So, what a good reason to go ahead and buy the cage-free eggs, or the organic milk? That’s what I did. Anyway, the rest of the recipe — basil and lemon — are not quite local. I do have a basil plant, which I got from the Farmers’ Market, but it’s a tiny, precious young thing still so I had to buy an extra bunch from a market which was probably shipped in from a warmer part of the country, like the lemon. I sooooo want to try this, and I think I’m going to try and use up my lavender too–I wonder if lavender grit might be as satisfying? Hi! I love your site and basil ice cream. I’ve made it before but I don’t blend the leaves. To get maximum basil flavor I let them steep whole in the milk as long as possible, sometimes overnight, then I strain out the whole leaves. You might try it that way sometime and see if you like it. i’m glad you did it, and thank you! looks AMAZING. save me some, girl! 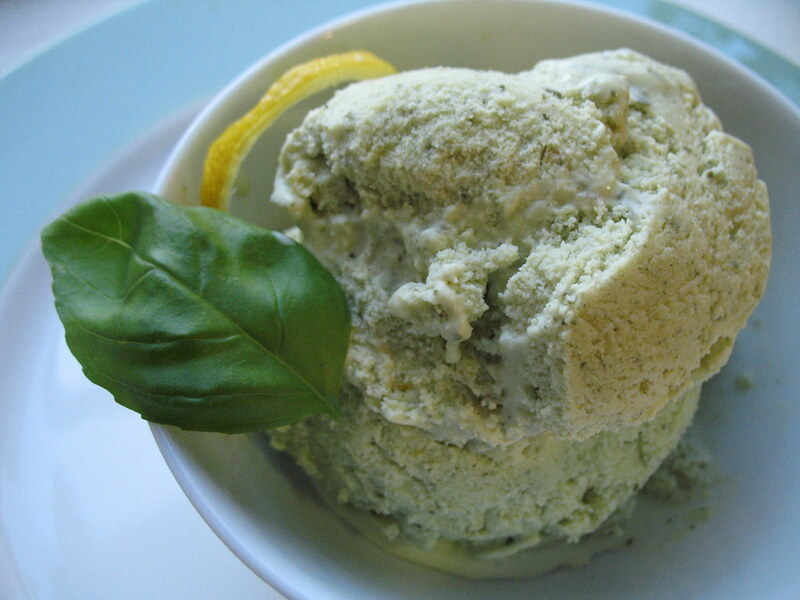 i love everything about basil ice cream – the flavor, the aroma, the color. i just planted mine today, but as soon as i have enough to pick, i’ll be making this. i might just steep and strain though, because i’m super picky about my ice cream texture. uhm i don’t think i’ve ever before been jealous that a blogger is getting to eat the food talked about instead of me. this ice cream sounds like pure heaven, even if it was gritty. i’ve been talking about an ice cream maker since last summer when i played with the one my mom has had since the early 90s. but hers is hand cranked and i can’t decide if i should get electric, which means i just haven’t done anything. what kind do you have? Hey! I’ve been lurking for a bit, but I check your blog daily. 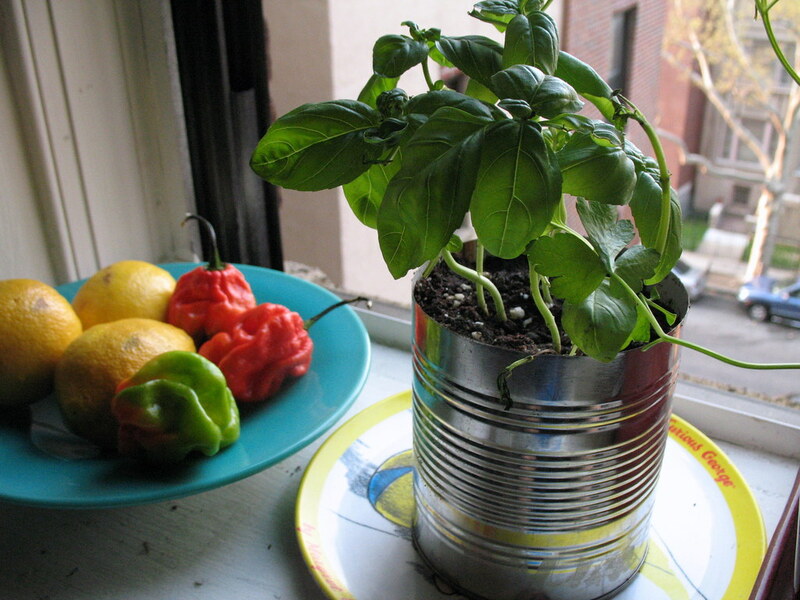 I’m moving to NYC in June and would love to read a post from you about the best windowsill herbs. I SO need step by step instructions because every plant I’ve ever had dies slowly. Also heard that direct sunlight is hard to get in the city. Would love any tips on growing my own beautiful basil plant!! Thanks. Hello, I just happened upon your blog. Very nice! I love basil, lemon and ice cream, though I have never considered them together. Sounds plenty yummy though! The other night I tried some Balsamic Vinegar and Fig ice cream that I purchased at a convenience store here in Kyoto, Japan. It was a little strange but pretty yummy. I didn’t have an ice cream maker last year, but I made a peach basil ice cream by just mixing up some chopped peaches and basil into a vanilla ice cream–one of my all-time favorite desserts. Basil is a great dessert addition! I made this last night and my roommate and I just ate it. Oh god it is AMAZING. I didn’t grind up the basil into my ice cream base, because I don’t like the texture of plant material in ice cream (and because the base kept on exploding out of my blender). The finished ice cream was still amazingly tasty and basil-y. 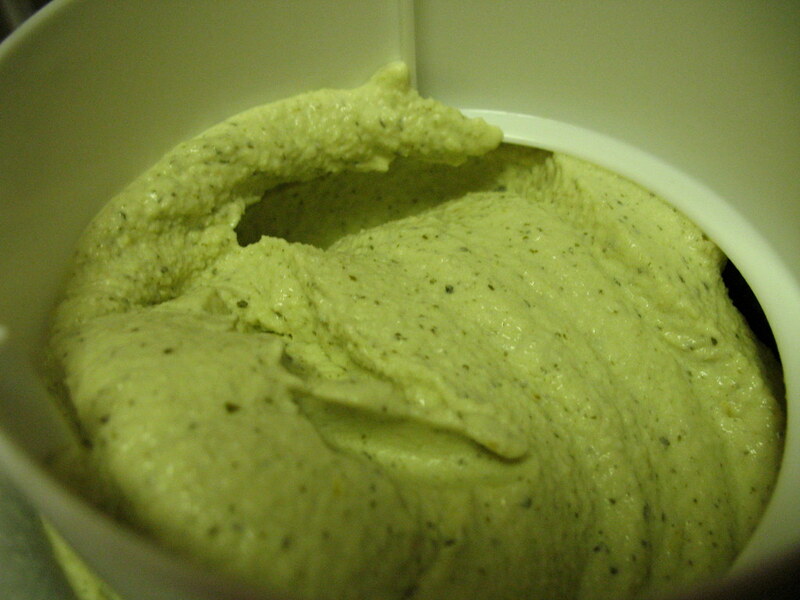 I have made basil ice cream before but wanted to try it with lemon also this time. I steep the whole leaves and strain them at the end so the ice cream stays white and smooth (same process for lavender). Do you think that adding lemon rind to the steeping process will cause it to curdle? Hi Madeleine: Actually, steeping the lemon rind sounds like a pretty good idea! I’ve seen it in other recipes so I don’t think it should curdle, and it would definitely solve the textural problem! Hope it works well!